This book takes a look at some of the most common and popular myths, legends, stories, and tales about Hinduism, and peels back the layer of myth to reveal the core of rationalism and philosophy behind. An excellent book. 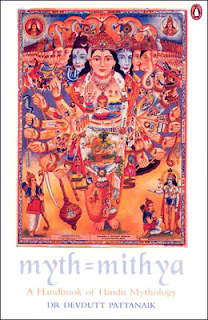 Based on my reading of the author's two books, Jaya , and Myth=Mithya , what seems to stand out are two things. Firstly, the style of writing is very crisp. To the point, almost. For example, in Jaya , there is little buildup of drama, of tension, of a sense of the sweeping drama that the epic can convey. Think of staccato as a style. Not as disconnected though, but still very crisp, and sometimes jumps from one point to another without much preamble. Secondly, and more importantly, the author's ability to pause and provide an insight, a learning, a point that the reader would most likely miss, is amazing. And therein, I believe, lies the value that the author is able to bring to the table. This ability to take learnings from several sources and distill them into concise pieces of learning is very valuable. The story of the Kauravas in Swarga informs us that there is always hope in the Hindu world, even for the worst of villains. But there is one place where there is no hope. That place is called Put. It is reserved for Pitr who are trapped in the land of the dead with no hope of being reborn.